The 15th Tata Motors IIFA Awards surpassed expectations with a spectacular show that saw the film Bhaag Milkha Bhaag nab the top awards of the night, including Best Picture, Best Direction, Performance in Leading Role (Male) Farhan Akhtar, Performance in a Supporting Role (Female) Divya Dutta and Best Story Prasoon Joshi. Deepika Padukone won the Award for her much acclaimed role in Chennai Express. The Bollyfabulous event took place at Raymond James Stadium in Tampa Bay, where Shahid Kapoor and Farhan Akhtar entered the stage in style, aboard a pirate ship full of shipmates throwing bead necklaces to the onlooking crowd. They were dressed in full pirate gear, and got the show off to a great start. They played off each other effortlessly throughout the night, engaging the audience and getting big laughs from all, with a live rap with some fellow actors, and antakshari with the audience. They cracked jokes at each others expense all night, and kept the audience thoroughly entertained. Shatrughan Sinha was honored with the Lifetime Achievement Award, which was presented to him by his daughter Sonakshi Sinha. He dedicated the award to the people of Bihar, and particularly Patna. First to perform was Penn Masala, an American a cappella group of students from the University of Pennsylvania who performed their massive hit ‘Evolution of Bollywood’. In the music categories, Aashiqui 2 swept all, including both Playback awards for Arijit Singh and Shreya Ghosal and the Best Music Direction for Mithoon, Ankit Tiwari, and Jeet Ganguly. Priyanka Chopra was next to perform, and mesmerized the crowd with some of her older hits, including Desi Girl, Jaane Kyon and Mujhse Shaadi Karogi. As she performed Tune Maari Entriyaan, Ranveer Singh joined her for a quick minute, and then Priyanka took John Travolta up for on stage with her to finish out the performance, energizing the crowd. Next was the launch of IIFA Coffee Table Book by the Founder – Directors of Wizcraft International Entertainment – Andre Timmins, Sabbas Joseph and Viraf Sarkari. Kevin Spacey then presented the Entertainer of the Year Award to Deepika Padukone for Chennai Express. Hosts Shahid and Farhan jumped in, and all four on stage ended up in lungis dancing to Lungi Dance, with Mr. Spacey matching the others step for step, amid the crowd’s loud cheers. It truly was a sight to be seen! 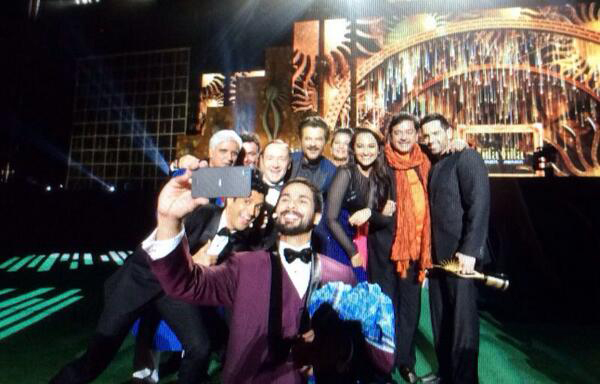 While he had Kevin Spacey, Shahid decided to try and recreate the famous Oscars selfie Bollywood style. He collected as many stars as he could, and they took a quick pic. Maybe it’s not as epic as the Oscars equivalent, but still pretty special. Next was a killer act by Ranveer Singh, who entered the stadium on a motorcycle to the music of Jigar Da Tukda. Ranveer’s energy was infectious, igniting the crowd as he danced to Jashn-e-Ishqa, Tattad Tattad, Ishqyaun Dhishqyaun and Tune Maari Entriyaan. Next were the debut awards, with winners Dhanush (Raanjhana) and Vaani Kapoor (Shuddh Desi Romance) there to collect their awards. Dhanush initially refused, but the crowd eventually talked him into singing a line of ‘Kolaveri Di’, much to everyone’s delight. Sidharth Malhotra performed a medley of songs, including Badtameez Dil, Laal Ishq, Raghupati Raghav and 1234 Get On The Dance Floor. Sid then took to the mic, saying he was going to get a girl from the audience to dance with him. The crowd erupted and hands shot in the air, but as Sidharth walked down to the floor, he headed straight for Parineeti Chopra and dragged her onstage for a performance of Drama Queen. Another brilliant moment was when Deepika took the stage to thunderous applause, dancing to Dilliwali Girlfriend, Kabira and Nagada Sang Dhol. The supporting role awards were up next, with Aditya Roy Kapoor (Yeh Jawani Hai Deewani) beating out heavyweights Anupam Kher and Nawazuddin Siddiqui. The female category award went to Divya Dutta for her performance in Bhaag Milkha Bhaag. Then, in one of the highlights of the night, Madhuri Dixit took the stage and performed a medley of her greatest hits, starting with Ek Do Teen, and including Mera Piya Ghar Aaya, Makhna, Kay Sera Sera, Dhak Dhak Karne Laga and Dola Re Dola. The big awards of the night came next, with Rakeysh Omprakash Mehra taking home Best Direction for Bhaag Milkha Bhaag, the life story of the Flying Sikh runner Milkha Singh. Milkha said, “I am thankful to IIFA for bringing me here and giving me respect. I have cried three-four times in my life. Whenever I see the film I cry. When I was sitting here now I was in tears seeing the love and recognition the film got.” Of course then there was a standing ovation from the entire audience! Hrithik Roshan rounded out the evening with an electrifying performance on his hit numbers Main Aisa Kyun Hoon, Bhoomro Bhoomro, Idhar Chala Main Udhar Chala, Senorita and Dhoom among others. In all, it was an incredible night with some amazing performances. Shahid and Farhan were outstanding as hosts, and the city of Tampa Bay was a great host to all of Bollywood. Stay tuned we still have the green carpet to come just making sure our shots are fabulous! So stay tuned we still have more IIFA to come! 16 queries in 0.543 seconds.